So we're back from a long break, to dive into the new The Walking Dead show trailer released at the 2015 San Diego Comic-Con. We also talk about participating in The Walking Dead Escape. Did we fall for everything that AMC was selling us in this trailer? Listen to find out. 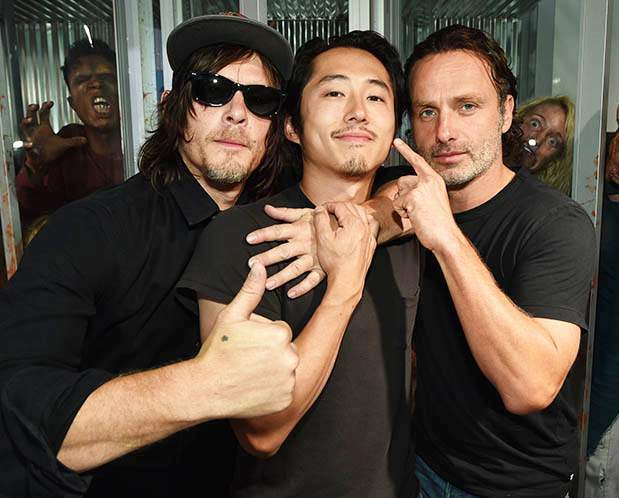 Norman Reedus (Daryl), Steven Yeun (Glenn) and Andrew Lincoln (Rick) stand in front of The Walking Dead display at Comic-Con. We touch a little on the new spinoff show, Fear The Walking Dead. We will be covering the entire Fear The Walking Dead first season as each episode comes out. So stay tuned for that when it starts August 23. There is a one week break after that, then Season 6 of The Walking Dead start back up and of course we will be covering that as well.